Now that football season is under way, it’s time to have some fun, relax, watch the game and let someone else do the cooking. The 19th Hole in Palm Desert provides game time enjoyment, perfect for Sunday Funday! Known to regulars as, “The Hole,” it is one of those desert spots that has been around forever. It doesn’t really advertise, or boast, they don’t even have a website. But perhaps they don’t need to. Locals in the East Palm Desert area just know that the 19th Hole is there, and has been for decades. I remember playing around Palm Desert Country Club as a kid, and hanging out in the old shopping center that was there long, long before Albertsons, The Dollar Store and CVS, when the main grocery store was Welty’s, which is now Welty’s Postal Connection. And there in the tiny shopping nook, was The 19th Hole. I recall wanting to enter, but realizing that it was part bar, I just peered in the window as little curious kids do. The old shopping center was torn down, and the modern construction took over. The 19th Hole was resurrected, and although it has morphed slightly since then, the essence of the place is still the same. It is still a local hangout, a neighborhood haunt that long time patrons can count on. More than a bar, the food is definitely one of the draws at The 19th Hole. They offer what most customers say, are the best Fish and Chips in the Coachella Valley, among other tasty menu items. And now with the kick off of football season, it is a chill place to watch a game or two on a lazy Sunday. Helping to make your Sunday even lazier, is their Bloody Mary Bar. It’s a build your own Bloody Mary scenario, where you are a given a pint glass with your chosen vodka and ice, and then you can choose your mix and different olives/beans or celery from the set up bar. It’s fun, and gives would be bartenders some concoction control. If a Bloody Mary is not your thing, their full bar is sure to pour you something that is. 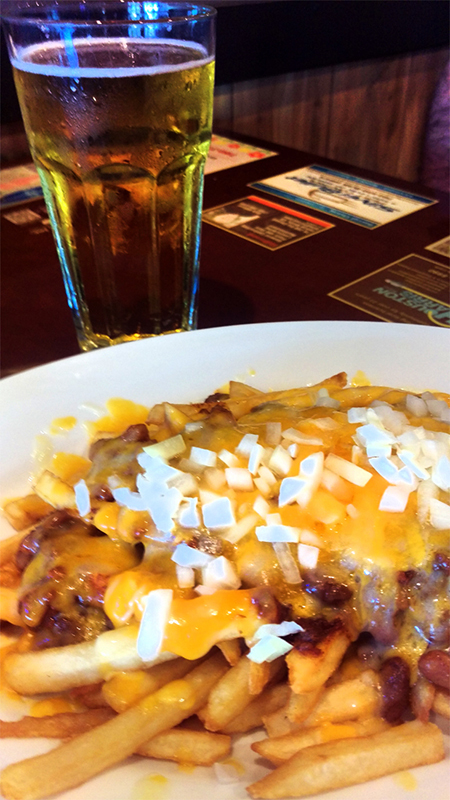 For me and my boyfriend, it’s a couple of chilly beers and an order of their super delish Chili Cheese Fries. The chili is portioned fairly with beans and meat in a rich sauce, over thin cut fries (thicker fries are available) and topped with gooey cheese (onions are optional). It is a perfect for pairing for a Sunday Funday. And if that doesn’t end up being enough for us, we usually will extend our appetite with an order of their excellent Buffalo Wing’s….which also go fantastic with cold beer. There are a variety of other menu items that make having a bite at The 19th Hole worthwhile, including weekend breakfast that is offered way past breakfast hours. Daily specials are also offered, and if you see that they have Chili Verde on the board, get it! Their Chili Verde is fantastic, and you can even get is served over nachos…big time YUM! Prices at “The Hole” are moderate, and they are opened daily. They stay open until midnight on the weekends, when they offer evening entertainment (starting this fall). 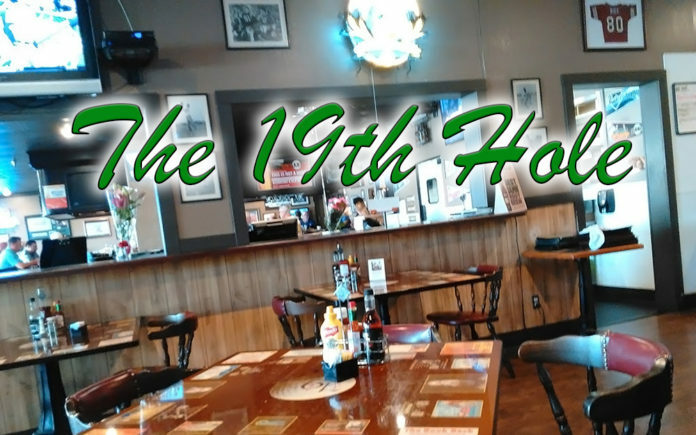 With TV’s all around, great drinks, food and an inviting neighborhood ambience, The 19th Hole is the place for football Sunday Funday, or to hang out anytime of the week.